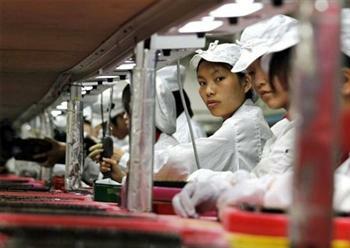 Nintendo will be investigating allegations that Foxconn employed underage students to bolster its workforce. Foxconn, the world's largest maker of electronic components, is fairly notorious when it comes to worker relations. The latest from the electronics manufacturer reveals that the company had been using workers that were under the legal working age, allegedly to make up shortfalls in the workforce. An internal investigation by Foxconn uncovered the teenage workers, who were under the legal working age of 16, in a manufacturing plant in Yantai, located in China's Shandong province. The teens were working in the plant as "student interns." The company openly admitted the mistake: "This is not only a violation of China's labor law, it is also a violation of Foxconn policy and immediate steps have been taken to return the interns in question to their educational institutions." Foxconn declined to comment on the actual number of teenage workers discovered, although an "unnamed Yantai government official" commented that 56 students would be brought back to schools. On the other hand, Chinese labor rights activists claimed that the teens were sent to the factory by their schools, who in turn threatened to deny students subject credits and graduation diplomas if the students refused to work. They also accuse Foxconn for failing to check the IDs of students in its internship program, which makes up 2.7% of its workforce. The activists claimed that the Yantai plant is "currently testing" Nintendo's Wii U console. China's official news agency, Xinhua, also alleges that Foxconn was employing underage labor in order to make up for a 19,000 employee deficit. Nintendo has stated that it is in communication with Foxconn and investigating the matter further. "We require that all production partners, including Foxconn, comply with these Guidelines, which are based on relevant laws, international standards and guidelines. If we were to find that any of our production partners did not meet our guidelines, we would require them to modify their practices according to Nintendo's policy." At the start of the year, Foxconn was investigated by Microsoft after 300 employees at an Xbox 360 manufacturing plant were threatening mass suicide over a pay dispute. Apple launched an inquiry soon afterwards to look into the worker's poor working and living conditions, sending voluntary auditors through facilities in Shenzhen and Chengu.